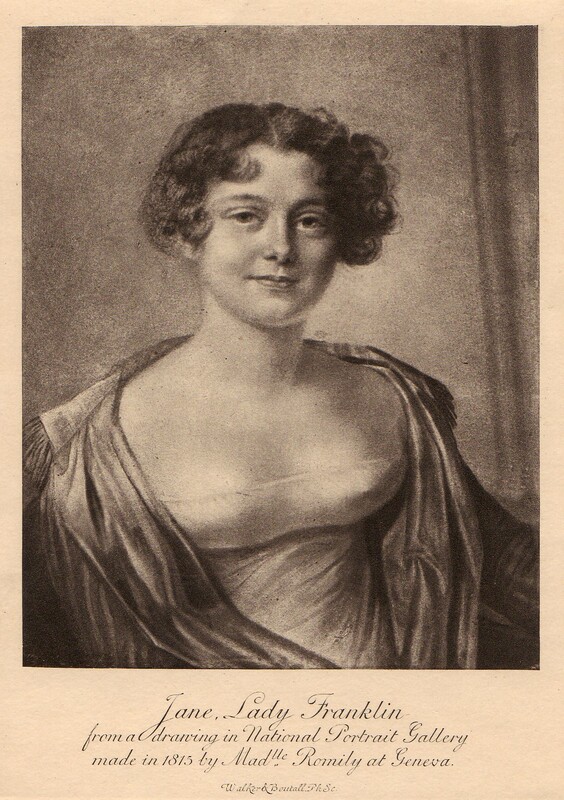 Jane Franklin (1791-1875) was the second daughter of three born to John Griffin. Her father has been variously described as an architect, a lawyer and "a liveryman and later a governor of the Goldsmith's Company." What we might conclude, is, that her father was a well educated man and well off; it seems he saw to getting his daughters a proper education. After a very short marriage, Franklin's first wife, Eleanor Anne Porden, died in February of 1825. They had been married in August of 1823. A daughter, Eleanor Isabella, was born to the couple in June of 1824. The health of the first Mrs Franklin, "always very delicate, began to fail rapidly within a year after the marriage. "1 Jane Griffin (Lady Franklin), as it turned out, was "a personal friend" of Franklin's first wife and "took an almost motherly interest in his orphan daughter." After his two overland treks in the north of North America2, and having been advised by the government that there was to be no further polar exploration, John Franklin turned to Russia where he stayed a spell and met all the uppercrust including the royals -- he was famous, worldwide. He returned to England in "early autumn" of 1828. The marriage to Jane took place on November 5th. They were within a week after that off to Paris to do the rounds. Returning to London the couple, at the beginning of 1829, took up residence on Devonshire Street, Portland Place. In April, Franklin was knighted; in July, he was granted a Doctor of Civil Law (The D.C.L.) at Oxford. The couple then spent peaceful days of wedded bliss between November of 1828 to August of 1830. Incidentally, at this time, 1829, at the age of 43, Franklin was "plump and comfortable." His appearance upon introduction caught more than a few people by surprise. This portly naval officer did not seem to fit the former image, one which would fit one who had suffered through "a prolonged diet of deer-hide and tripe de roche." In the meantime he waited on the Admiralty to give him a project, a command worthy of his record. (There were other opportunities for Franklin in the colonies or, indeed, other countries; but he wanted to stay close to his naval career which by then had extended to thirty years.) On August 23rd, 1830, Franklin got his command, the captain of HMS Rainbow3. In Arctic Archipelago, I have woven in Jane Franklin's energetic role, a role she never gave up, a role she played in the search for her husband; it is to her that the "heroic story" of John Franklin has survived through the years. 2 See Franklin's First Arctic Expedition and Franklin's Second Arctic Expedition. 3 The HMS Rainbow was a 28-gun sixth rate launched in 1823 and sold in 1838.